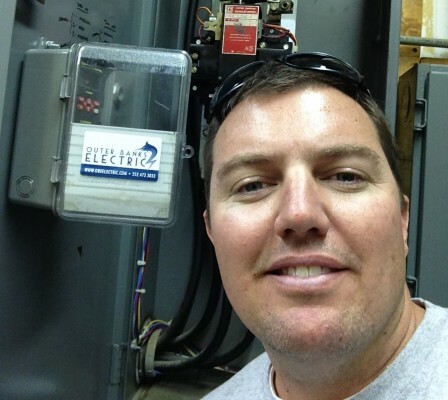 Outer Banks Electric is a locally owned and operated family Electrical Contractor business, run by owner Chris Knight and nephew Ryan Joyner. Together they have 21 years experience working with customers and doing electrical work on the Outer Banks. Chris Knight grew up in Norfolk where he began working in the electrical industry in 1992. In 1994 he started a 4 year apprenticeship program that he completed in 1998. There he learned the theory of electricity as well as the hands-on experience of being an Electrical Contractor. He was required to complete 8000 hrs. in the field, as well as keep an honor roll status at the classes for 4 years. All 8000 hrs in the field had to be documented and had to meet a strict set of guidelines for the type of electrical work. This is where he learned high voltage, low voltage, single phase, three phase and all types of commercial and industrial electrical applications. From running bucket trucks, backhoes and cranes to bending pipe, pulling wire and installing switch gear. In 1998 after graduating with honors and receiving his electrical license in the state of Va., Chris was sent to Manteo with the company he was working with (Watson Electric) to help complete the construction of Roanoke Island Festival Park and the North Carolina Aquarium expansion. He was also responsible for running the job at State Employees Credit Union Manteo and the Dare County Health and Social services building. The company work then moved from the area back to Virginia. Chris decided to stay in the Outer Banks. After a brief time working as the states electrician and then at Spencer Yachts, Chris started his own electrical contracting company and became licensed in the state of North Carolina in 2001. His first job was to re-wire the original Jenette’s Pier and cottages for the state. From there he went on to do all types of commercial and residential projects, from Dare County water towers, parking lot lighting construction, marinas, boat yards and restaurants to 12000 sq, ft houses. His company grew to 18 employees and 12 trucks, and in 2009 the company was sold. Chris now is back to his original passion of hands on doing it himself, in the field electrical work. He holds an unlimited North Carolina Electrical license. Ryan Joyner grew up in Virginia Beach before moving to Camden County, NC during high school. He started his electrical career working those summers for his uncle Chris Knight at his electrical company based in Manteo. Ryan then attended Cape Fear Community College in Wilmington, NC. 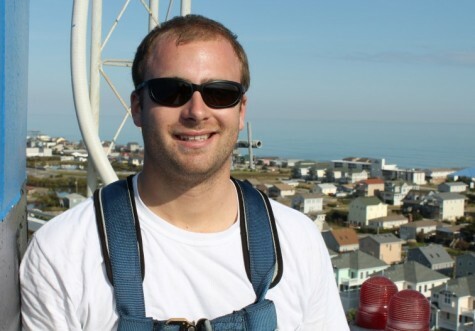 He returned to the Outer Banks in 2009 and spent four years doing commercial projects, service work, and operating the company bucket truck. In 2013, Ryan joined up with Chris again to help start a commercial and residential service company specializing in quality installations and friendly service.